Impact Hub Global Report – This is K-Tiv. 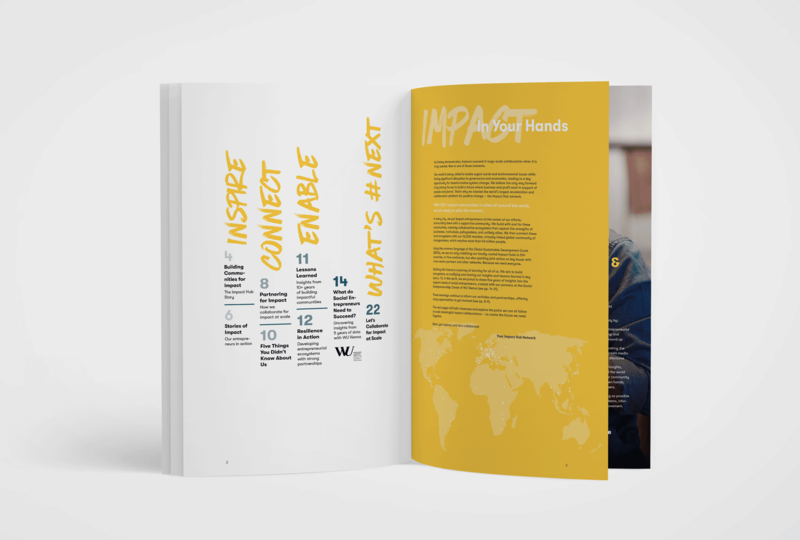 The Impact Report 2018 was a collaboration with the communications team of the Impact Hub Global network. This globally-connected network of 100+ purpose-driven innovation ecosystems has never had the chance to tell the full story of the impact it’s had in enabling the growth of entrepreneurs with social and environmental goals. On the editorial side, K-Tiv worked with the comms team, Impact Hub members and executive staff in uncovering inspiring stories of change, setting these stories within a cohesive narrative, and editing the report to completion. For design, we built on Impact Hub’s established visual identity, creating an arresting new identity that bought the report to life, completed a satisfying layout of the desired content and took care of printing.